1. Combine the grated zucchini, diced onion and salt in a large covered stock pot. Let stand overnight. The next day, rinse and drain well. 2. Add all remaining ingredients except corn starch. Cook 15 minutes on medium heat, stirring occasionally. 3. Mix corn starch with small amount of cold water and add to cooked mixture. 4. Pour into hot sterile jars, seal and process in boiling water bath for 10 minutes. Note: The jars can also be stored in the refrigerator for several months (without the need for the boiling water bath). Creative Uses: During late summer in Vermont (and in many areas) there’s always an abundance of zucchini squash. 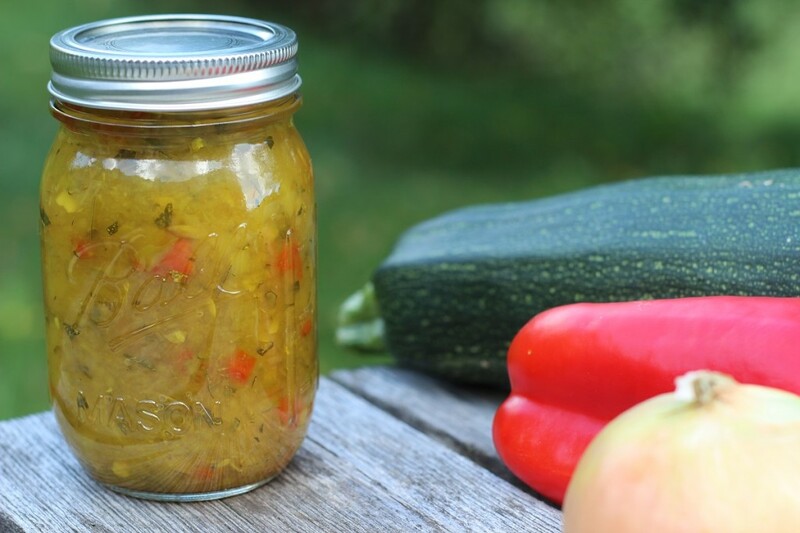 There are many delicious ways to use this healthy veggie and we think this mouth watering relish is good enough to eat by the spoonful! It’s the perfect condiment for hamburgers, hotdogs and brats. It can be added to meatloaf, quiche, potato salad, tuna fish, meatballs and more for a unique flavor that’s sure to enhance whatever you’re cooking up.